A screen shot from "Woodstock", 1970 Warner Brothers, shows Mission Helper of the Sacred Heart Sister Susanne Bunn as a young nun. JOPPA – There’s a time and place for the story of how Sister Susanne Bunn of the Mission Helpers of the Sacred Heart became a cultural icon. “I use it in conversation when I don’t know the person, and I’m not sure what to say,” she said. Such was the case when the Catholic Review telephoned Prince of Peace parish in Edgewood some months back, looking for the pastor. 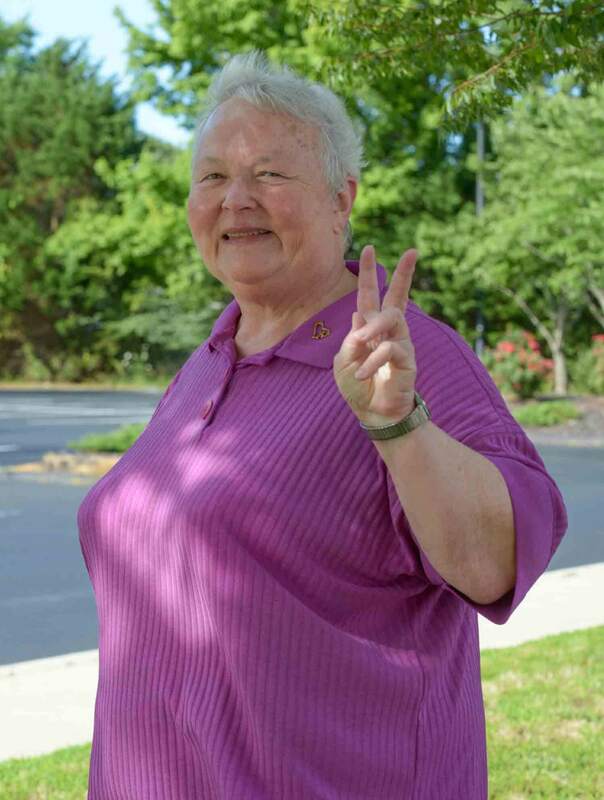 Instead of treating us to Lionel Richie’s “Hello” or similar fare, Sister Susanne, who runs religious education programs there and at Holy Spirit in Joppa, told a story – how she became the “Woodstock Nun” in 1969. Clad in simple tan habits and black veils, the sisters smile shyly as they walk off camera, their modestly upright postures contrasting with the hippies’ cool slouches. The whole clip lasts about six seconds. As it ends, one of the nuns – young, slender, gentle smile, dark hair – pauses. As the other two depart the scene, she directly faces the camera and raises two fingers on her left hand in the universal sign for peace. The filmmaker deemed the moment significant enough to freeze the frame briefly before moving on to the next snippet. Today, it’s the image that pops into most everyone’s head when “the nun flashing the peace sign at Woodstock” is mentioned. The friendliness may be part and parcel with her upbringing in South Baltimore, where she attended Mass at St. Mary, Star of the Sea in Federal Hill, and scrubbed the marble stoop at the entrance to her row house – then an act of drudgery, now a legendary symbol of conscientiousness lost to the ages. Her family spent summers on Stony Creek in Anne Arundel County. She first encountered the Mission Helpers after completing the eighth grade at Francis Scott Key Elementary/Middle School in Locust Point. A cousin had to turn in make-up homework to the School Sisters of Notre Dame at their local convent, and asked for some company. “I said, ‘Not me – I’m not going near any convent,’ ” Sister Susanne remembered. A sudden thunderstorm washed away her volition and she found herself taking shelter on the porch, meeting Mission Helpers doing the same thing. They were in town to offer vacation Bible school, and, after some cajoling, Sister Susanne wound up participating in their teenager-focused evening classes. The sisters covered the sacraments, the creed and the commandments in ways that contrasted with her previous experience of religious education – compulsory memorization of the Baltimore Catechism. After completing her secondary education at Western High School, and earning a bachelor’s degree from what is now Notre Dame of Maryland University, Sister Susanne joined the Mission Helpers in 1964. “And God, with his sense of humor … we had to memorize the Baltimore Catechism in novitiate,” she said. She was soon leading religious education. The ministry brought her and the other two unlikely celebrities to upstate New York in 1969. The sisters served at St. George and St. Francis, in Jeffersonville and Youngsville, respectively. The Franciscan pastor of the two churches suggested that the young women might want to check out the setup for a huge concert planned – several miles to the south – during their weekend downtime. She had not heard of Woodstock at that point, and to this day, does not know which musicians played there. Though the film suggests that she and her fellow sisters were entering the festival, they were actually at the site days prior and saw only a mowed field, the stage, and two large tents, one for media and one for treating drug overdoses. A few early arriving groups were setting up camp. “I said to the other two sisters, ‘Don’t look now, but we’re being filmed,’ ” remembered Sister Rita, reached at her home in Pennsylvania. There was also an interview request. The sisters have various theories about the longevity and pervasiveness of the image of “the nuns at Woodstock,” which has been acknowledged in various films – “Taking Woodstock” (2009), for example – and commercials. “It was probably just because there were all of these other people, and then, all of a sudden, you see these three nuns in habit,” Sister Rita said, scratching the surface. “I think people want to know what the connection is between their church – their faith – and their life,” Sister Susanne said. “That’s so positive,” marveled Mission Helper Sister Elizabeth Langmead, president of the order’s central leadership team, who sat in on Sister Susanne’s interview with the Catholic Review at Holy Spirit Church. Sister Elizabeth said she believes the image has come to illustrate the breadth of the “revolutionary-type attitude” of the time, so powerful that – according to some appearances – not even the Catholic Church was immune. The statement is true – at least in the context of the conversation. If the half-dozen or so anecdotes of her life she spliced into her Woodstock story have anything in common, it’s her joy in spreading the Gospel. Her internet footprint is small and limited to her present roles in Harford County and a 2014 letter to the editor, published in the Catholic Review, in support of Hobby Lobby’s fight to avoid providing abortifacients through its employee health plan. Sister Susanne remains a little behind the times on music, cautiously allowing that she listens to classical in the car. On a trip to New Jersey, however, she discovered a certain country song. “The chorus was ‘God is great; beer is good; people are crazy,’ ” Sister Susanne said.